Frisco Station is a 7 floor hotel project located in Frisco, Texas. The contractor, Design Construction, has years of experience in hotel projects and made the wise decision to use Hydro Mobile Mast Climbers to increase their productivity on this difficult stack-bond brick project. This project is a challenge with the multiple returns, in addition to it being stack-bond pattern, requiring quality workmanship from the masons. The Hydro Mobile M2 Mast Climbers are versatile enough to provide the mason with a quick setup around corners and keep the flow going all the way up. The above area shows a return that they were able to easily setup to cover the stairwell. 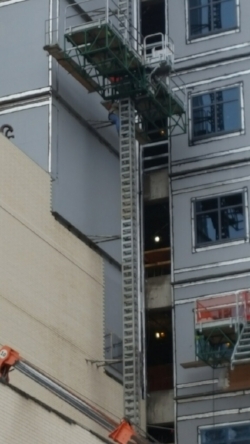 The smaller length of the stairwell wall required the use of a 14’ M2 Hydro Mobile Mast Climber vs. the traditional 24’ M2 units used on other areas of the job. The 14’ M2 unit is able to provide the same large capacity of 22,000 lbs, a 7’ deep work platform, and stability of having two masts vs. using a single mast system. Additionally, Design Construction used the M2 Hoist for this project to keep the masons continually stocked. At a capacity of 4,000 lbs and speed of 65 ft per minute, these hoists will keep production going, even after you’ve outreached your forklift. Being their first project with mast climbers, Spec Rents held a full installation and dismantle training course for their E&D crew. Our instructors spent multiple days assisting in their first setups and going back out to assist with dismantling and moving units to additional setups. If you’ve got a construction project coming up that you’re considering mast climbers on but haven’t taken the leap and have questions, give us a call. We’re happy to walk you through the process to find the best solution for your specific challenges. Spec Rents is the proud distributor of Hydro Mobile for Texas. Although we are technically an equipment company, we’re not just in business to sell and rent equipment. We provide our customers with equipment solutions that provide safety and increased productivity. Let us know if we can help you achieve your company’s goals. I hear it every day. “We can’t find good masons.” Or “There’s not enough labor out there.” The problem is two-fold, in my opinion. We can’t find people who want to work in masonry. We aren’t training enough people to fill the gap of those who are starting to retire. I’m the proud daughter of a masonry contractor. My dad called himself an “artistic manipulator of the burnt clay product.” He started as a laborer for a company, went through an apprenticeship, was a mason, became a foreman, moved into estimating…. All with the same company. When that company started to slow down, he and my mom started their own company. He had pride in what he did. And I’m proud of the work he has done over the years and the work our company helps masons to do now. I think this is something we are really missing out on. We need to bring back the pride. What masons do is nothing less than an art. Think about being an electrician or a plumber or a framer. Sure, they’re also proud professions that are absolutely necessary. But what masons do is beautiful and lasting. It’s something you can be proud of for generations to come. How can you help bring back the pride to masonry? Here’s a 12 ideas to get you started. Make a big deal out of the projects your crews are on. Tell them about it. They like to know details like how many brick are on it, what it will be, etc. Some companies have hats or shirts made for really big projects to give to their guys. Something small like that can go a long way. You’ll find the guys are proud to be a part of something like this. Take part in masonry competitions throughout the country. These are a chance for the best masons to show just how great they are. These guys (and hopefully one day gals) are beasts- the amount of brick they can lay is nothing short of amazing. Encouraging and supporting your guys to train and then participate in these can be a great way to show that this is a great trade to be in. Check out the 2019 SPEC MIX BRICKLAYER 500® to learn more. We build cool stuff but some of them may not ever get to see the finished project. Consider doing a company newsletter, whether paper or digitally. Or maybe do a Facebook page where you can share pictures and they can too. The younger generations live on this kind of stuff. Keeping your website up to date is important too. Make new hires feel welcome by introducing them to the team they’re working with. Your crew should be a team. This means they know and help each other out. They watch out for the new guy and help them, showing them the ins and outs of both the company and project they’re starting on. You’ll find their productivity will go up substantially if you’ll do this. And, really, how hard would it be to introduce them at your weekly toolbox talk and pair them up with someone? This will give your current employees something to be proud of doing as well. Train new hires appropriately on what expectations are, what benefits they have access to, and, most importantly, safety. It takes time to do this, but you’ll save a lot of headaches by doing so and they’ll know your company culture and be better acclimated to it this way. Spending time to do so shows you care about them as individuals. Happy employees = productive employees most of the time. Have a company party yearly. This doesn’t have to be anything fancy but it’s a way for everyone to get together and see each other. Maybe do a slide show so their family can see the projects they’ve been on over the past year. Think of how proud your kids are when they show you all of the projects they’ve worked on for open house at school. It’s the same concept. Advance from within your company when you can. Provide a career path that they can easily see. Some of the best superintendents, project managers, and estimators were labors and masons first. People want to be proud to grow up and advance within a company. Recruit from high schools by creating relationships with counselors. We know that everyone isn’t going to college and doesn’t need to. Providing information on a career path in masonry and showing off the awesome projects they could work on, can help with recruiting. Check out the Top 10 Reasons to Join the Masonry Team booklet by MCAA. It’s available to MCAA members for free so be sure to order yourself some for your next recruiting efforts. Communicate effectively- they want to know what’s in the pipeline and where they may be going next. Daily meetings may be time-consuming but a quick 5-10 meeting to tell the crew what their goals are might make the difference between them making production or not. Also, get some excitement going about upcoming work. Also, communicate any changes effectively- ex: safety, change in address, policies, holidays, etc. Celebrate victories- whether it be 100,000 hours injury free, topping out a wall, landing a big project, receiving a new piece of equipment, or even personal victories. Provide your crews with good equipment and products - If you keep giving them stuff that breaks down or doesn’t work well, it will not only slow your project down but they’ll also realize it’s not worth taking care of. And so the cycle continues. Providing good equipment and then training and requiring them to maintain it well is a way to instill pride (and responsibility) in some of the younger generations. Consider a yearbook- whether digital or paper- that you put pictures of all of the projects completed in the last year that you can share with your teams. You can be sure they’ll be proud of this. That’s a lot of ideas. Don’t be overwhelmed. Start small. You’re probably already doing some of these so why not just make sure everyone in the company is aware? If you’re not doing any of these, I challenge you to pick 1 or 2 that you can quickly implement for your teams. Do your part to bring back the pride in masonry. Whether you’re a Project Manager, a laborer, Superintendent, truck driver, or the payroll clerk, you have a lot to be proud of in your company! You see, down here in Texas, the tide has been slower to turn to using mast climbers. With lower labor costs than in the northern states, Texas contractors haven’t had to look to innovation as much to help with cutting costs and lowering productivity over the years. 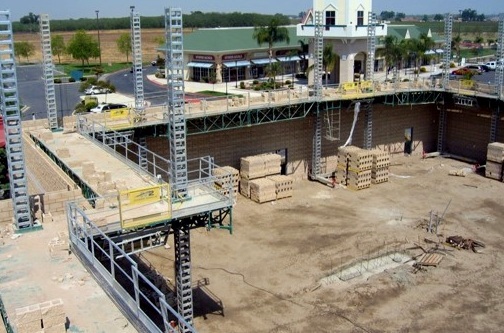 Times are changing and mason contractors in Texas are starting to see that it’s cheaper to spend more on innovative equipment and scaffold that takes fewer employees and less time, while improving productivity and safety. In the past year I’ve had multiple contractors that started using Hydro Mobile for the first time tell me that they wonder why they’d waited so long to go this direction. 22,000 lb capacity. That’s a lot. But remember that masonry is heavy work. A pallet of block may weigh between 2,000 and 3,000 lbs. 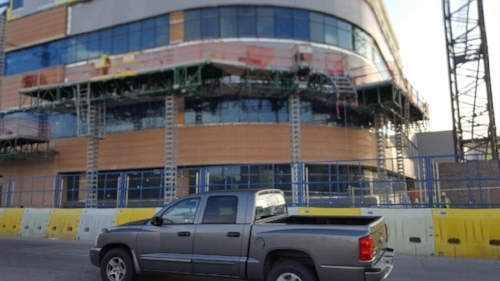 What does having 22,000 lb capacity mean for mason contractors? You’ll be able to adequately stock your materials, your mortar, your saw, your crew, tools, and even probably have capacity left over for a port-a-potty. 7’ wide deck. This is from front to back (before adding walk-boards). What does this mean for companies? Not only do you have the capacity (see above note) you need, but you’ll have room to put all your materials and equipment with room left over for your laborers to move around productively. Hoist system. Why go to the expense of renting a crane or larger forklift when the M2 Hoist system can do the job for you? Its 4,000 lb capacity handles full pallets of brick and block easily and it’s hydraulic power pack delivers 65’ per minute lift speed. What does this mean for mason contractors? No more waiting around for materials. No more stocking from the building, which takes a lot of labor. Less expense for renting cranes and larger forklifts. Solid deck. How many boards do you use with conventional frames? A lot. And boards aren’t cheap. And they’re not light weight either. Most General Contractors are requiring every level to be decked out completely, requiring a lot of boards. What does a solid deck mean for your crew? Besides not having to use money and time for walk-boards, you also have a solid deck with fewer trip hazards and an easier way to push things around on wheels such as mud tubs or brick/block carts to cut down on labor time. (If you’ve not tried using a Hog Cart or the Hog Troughs, give them a try). Monorail System. Anyone that has ever done a large stone job knows how hard keeping up with production and safety is for masons and laborers alike. 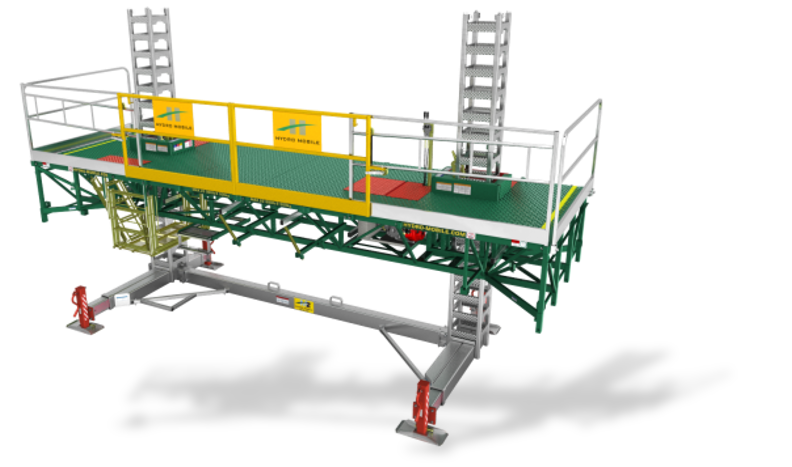 Using a monorail system allows crews to slide loads along instead of manually handling them. What does this mean for your team? Less lifting injuries. Better productivity. Some masons use monorails systems with their conventional frames. Although, this is still an improvement over man-handling large materials, it requires re-positioning the system as you go up/down the wall. With Hydro Mobile the monorail system goes with you. Increased Productivity. Because the platform goes up with the wall, materials and working height can always be placed at a comfortable height for your crews. What does this mean for mason contractors? It requires less bending and lifting for your masons, resulting in happier, more productive team members. Plus, there’s no question this is better from a safety perspective. But wait, there’s more. No more stopping to raise the walk-boards. Imagine getting that time back! Make Returns and Reach In-sets and Step-backs. Hydro Mobile M2s are built to accommodate up to 8 walk-boards for your crews to use in addition to the 7’ platform. Using the Multi-purpose Inserts, you can reach 14’ beyond the 7’ platform. What does this mean for your project? In many cases, it gives you the ability to make returns without having to set up another set of scaffold. It often helps with those projects that have in-sets or step-backs so you can reach the work surface without having to set another scaffold system up. I’m often told that Hydro Mobile M2s are made for long, straight walls, not cut up projects. While it’s true that they do work well on those types of walls, the ability to use 8 walk-boards or the Multi-purpose Insert makes Hydro Mobile M2s a good choice for cut up projects too because of the flexibility and reach they provide. Hydro Mobile M2 Mast Climber - Masons laying on interior with multiple returns. Hydro Mobile M2 Mast Climber - Masons using extended outriggers and walk-boards to reach wall with bump-out. Quick Set-up. Think about how long and how many of your crew it takes to set up 148’ linear x 35’ vertically. Is it longer than a day? Probably. You can install this amount of Hydro Mobile M2 mast climbers in 3 - 4 hours with an experienced crew of 2 scaffold builders and an operator. What does this mean for mason contractors? Faster setup = reduced labor costs and getting on the wall faster. Safety. Safety systems are built into M2 mast climbers, including built in guardrails with integrated toeboards and material gates for convenient loading. What does this mean for companies? Built-in safety systems mean less chances of human error that can lead to serious injuries such as missing guardrails, etc. Additional safety comes in the form of proper ergonomics for masons not having to bend and lift as much. Hydro Mobile M2 Mast Climber includes built-in safety features such as guardrails, toeboards, anchor points, and materials gates for convenient loading. It’s obvious that the Hydro Mobile M2 mast climbers are made for Masonry, hence the “M” in M2. Although they’re designed to meet the challenges of the masonry industry, they are a great shared system for multiple trades also because of the above safety and productivity topics seen above. Check out our project page for some pictures of these in action. Let us know if you’re curious if mast climbers might solve some of the safety and productivity issues your company is having. We are always happy to help a contractor find the best solution for their specific challenges. Spec Rents is the proud distributor of Hydro Mobile for Texas. Although we are technically an equipment company, we’re not just in business to sell equipment. We provide our customers with safety and productivity. Let us know if we can help you achieve your company’s goals. We have learned that OSHA will be releasing approximately 300 questions and answers regarding the silica rule. They are clarifications to the rule and will help contractors understand the rule better. Below is a quick summary from the CISC attorney giving you a summary about the questions. The MCAA worked in conjunction with the coalition on these questions. You will find several questions specific to masonry installation and we are confident that you will find the clarifications helpful. We want to remind you that if you have an OSHA inspection and silica is brought up, discussed or you receive a citation for silica, we would like to hear about it. We are tracking the enforcement side of silica across all the trades and where we see issues or interpretation discrepancies, we will be asking OSHA for clarification and explanation and if warranted a discharge of a potential citation if it was done in error. Communication will be key as we see the enforcement of this newer rule likely pick up in the months ahead. The Occupational Safety and Health Administration (“OSHA”) has just released a set of 53 Frequently Asked Questions (“FAQs”) to provide guidance to employers and employees regarding OSHA’s respirable crystalline silica standard for construction. Through the Construction Industry Safety Coalition (“CISC”), Mason Contractors Association of America was involved in the formulation of these FAQs. The development of the FAQs stemmed from litigation filed against OSHA by numerous construction industry trade associations challenging the legality of OSHA’s rule. OSHA has also agreed to issue a Request for Information (“RFI”) on Table 1 to revise the Table to improve its utility. Mason Contractors Association of America will continue to look for ways to work with OSHA to improve the workability of this significant rule. The FAQs are extensive and organized by topic. A short introductory paragraph is included for each group of questions and answers to provide background information about the underlying regulatory requirements. While employers are encouraged to review all of the FAQs, the following are some of the clarifications provided in the document. The standard applies to all occupational exposures to respirable crystalline silica in construction work, except where employee exposures will remain below an Action Level (“AL”) of 25 µg/m3, calculated as an 8-hour time weighted average (“TWA”), under any foreseeable conditions. The exception is intended to ensure that the standard does not apply to employees whose work results in only minimal silica exposures. The FAQs clarify that many common construction tasks are likely to be outside the scope of the standard because they typically generate exposures below the AL. This includes mixing small amounts of mortar; mixing small amounts of concrete; mixing bagged, silica-free drywall compound; mixing bagged exterior insulation finishing system base and finish coat; and removing concrete formwork. In addition, tasks where employees are working with silica-containing products that are, and are intended to be, handled while wet, are likely to generate exposures below the AL (examples include finishing and hand wiping block walls to remove excess wet mortar, pouring concrete, and grouting floor and wall tiles). The FAQs also state that many silica-generating tasks performed for only 15 minutes or less a day will fall outside the scope of the standard. The standard permits employers to select from two methods of compliance to control exposures to respirable crystalline silica: “specified exposure control methods” commonly referred to as Table 1 or “alternative exposure control methods.” Employers that follow Table 1 do not have to assess employee exposures or separately ensure compliance with the permissible exposure limit. Table 1 includes common construction tasks. The FAQs clarify that the Table 1 requirement that employers “operate and maintain” tools “in accordance with manufacturer’s instructions to minimize dust emissions,” applies only to manufacturer instructions that are related to dust control. Other information in these instructions, including recommended respiratory protection, do not have to be followed for purposes of the standard. For a few tasks on Table 1, respirator requirements vary based on task duration, i.e., whether the task is performed for “less than or equal to four hours/shift” or “greater than four hours/shift.” The FAQs make clear that an employer does not have to track the exact amount of time that employees are performing a job throughout a shift to be in compliance with Table 1. Rather, before a task is performed, an employer must make a good-faith judgment about whether the task will take more than four hours. If the employer anticipates that an employee will be engaged in a task for more than four hours, the employer must provide the employee, at the beginning of the shift, the respiratory protection required in the “greater than four hours/shift” column on Table 1. If, in contrast, the employer anticipates that an employee will be engaged in a task for four hours or less, the employer needs to provide respiratory protection in accordance with the “less than or equal to four hours/shift” column. Finally, the FAQs clarify that handheld powered demolition hammers with bushing tools and tile saws are covered by Table 1. The standard includes requirements related to housekeeping on construction worksites. In particular, employers must not allow dry sweeping or dry brushing “where such activity could contribute to employee exposure to respirable crystalline silica unless wet sweeping, HEPA-filtered vacuuming or other methods that minimize the likelihood of exposure are not feasible.” In addition, employers must not allow compressed air to be used to clean clothing or surfaces where such activity could contribute to employee exposure to respirable crystalline silica unless: (1) the compressed air is used in conjunction with a ventilation system that effectively captures the dust cloud created by the compressed air, or (2) no alternative method is feasible. The FAQs clarify that if employee exposure will remain below the AL under any foreseeable conditions, the prohibition on dry sweeping, dry brushing, and the use of compressed air for cleaning clothing and surfaces does not apply. They also clarify that the prohibition on these activities only apply to housekeeping activities, not to the use of these practices to perform a work task. The standard requires employers to establish and implement a written exposure control plan that contains at least the following elements: (1) a description of the tasks in the workplace that involve exposure to silica; (2) a description of the engineering controls, work practices, and respiratory protection used to limit employee exposure to silica for each task; (3) a description of the housekeeping measures used to limit employee exposure to silica; and (4) a description of the procedures used to restrict access to work areas, when necessary, to minimize the number of employees exposed to silica and their level of exposure, including exposures generated by other employers or sole proprietors. The FAQs clarify that the standard does not require employers to develop a new written plan for each job or worksite. It requires only that employers have a written exposure control plan applicable to each worksite. Employers may develop a single comprehensive written exposure control plan that covers all required aspects of the plan for all work activities at all worksites. The FAQs also clarify that when silica generating tasks are being performed, the standard is not intended to prohibit all employees from entering entire areas of a construction site simply because employees in those areas are performing some work involving the generation of silica. The rule calls only for minimizing the number of employees in the relevant work areas. The standard does not preclude employees from entering work areas where silica-generating tasks are occurring when it is necessary for them to do so. The standard requires construction employers to make medical surveillance available at no cost, and at a reasonable time and place, to any employee who is required by the silica standard to use a respirator for 30 or more days a year. An initial examination must be offered within 30 days of initial assignment, unless the employee has received a medical examination that meets the requirements of the standard within the last three years. The employee will receive a written medical report within 30 days of each exam that includes: (1) a statement indicating the results of the medical examination; (2) any recommended limitations on the employee’s use of respirators; (3) any recommended limitations on the employee’s exposure to silica; and (4) a statement, if applicable, that the employee should be examined by a specialist. The employer must also obtain a written medical opinion within 30 days of each exam, which contains more limited information than the report to the employee. The opinion to the employer contains the date of the examination, a statement that the examination has met the requirements of the standard, and any recommended limitations on the employee’s use of respirators. The FAQs make some important clarifications regarding medical surveillance. The silica standard does not preclude in-house health care providers from performing the required medical surveillance examinations. In addition, the standard does not preclude employers from receiving the same information that employees receive from the surveillance examination, if it is received for other purposes and through other means, such as through workers compensation records and proceedings. The FAQs also make clear that the standard requires employers to make medical surveillance available to qualifying employees, but does not require that employees participate in the surveillance. More information and updates can be found at masoncontractors.org. 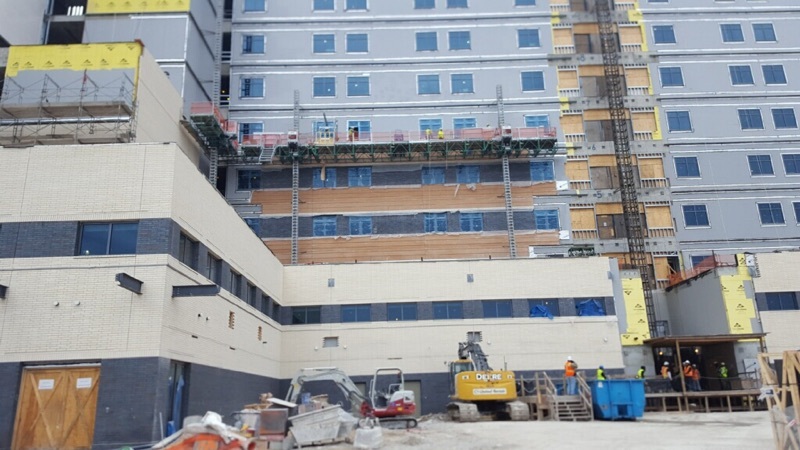 Shadrock and Williams Masonry, Ltd. is currently completing the masonry on the new Christus Spohn- Corpus Christi Shoreline Tower. The combination of their expertise in complex projects and quality equipment, such as the M2 and P Series Hydro Mobile, are helping to make this project a success. Spec Rents is proud to partner with Shadrock and Williams on this project to make it a safe and productive one. Thanks to Mark Beers, at Shadrock and Williams, for allowing us to share these photos. 1. Put safety first always. Providing a good safety program may go unnoticed but if you remind them that you're keeping them safe so they can go home every day to those who love them, it can go a long way. 2. Write a thank you or card to their family. Brag on them and say thanks for sharing them with you. There's may hours of overtime throughout the year in construction. Let them know you appreciate the sacrifices they sometimes make for the jobs to get built on time. 3. Provide good equipment. I know, I know. You're thinking, "but they tear it up!" What if you said you're providing it because you know they'll appreciate the quality and take care of it? It may go further than what you'd think. 4. Communicate across the company. Team meetings to review upcoming work and newsletters, blogs, or social media can help keep employees informed of what’s happening across the company and what's coming down the pipeline. It will make them feel valued and secure in the future. 5. Provide breakfast or lunch periodically. They say the way to a man's hear is through his stomach. As a female, I would say this is true for women too! A family that eats together stays together. Your team is your work family and we all want them to stick around, so this is a good way to boost employee morale and thank employees for their hard work at the same time. Something as simple as pizza, burgers, or breakfast burritos will do the trick. 6. Give them company apparel. Most employees will proudly wear this as a badge of honor that they work with your team. Let them show their company pride with a branded hat, shirt, or jacket! Here’s another way to market your brand at the same time. 7. Recognize exceptional work! When you're finished with a project, share the excitement and tell them they're a part of the team that made it a success. You could give them a photo of the project, a project t-shirt or hat, or a celebration to show your appreciation (see #5 and #6). 8. Recognize Employees of the month. This can be a hard one- depending on the company size and configuration but it can go a long way. Consider having each foreman nominate someone. Be sure to include why they were nominated. Recognizing them in a newsletter, a meeting, a certificate, or a special hat or shirt would all be great ways to do this (see #6). 10. Provide training and/or advancement opportunities. Workforce development is a huge buzzword right now and for good reason. We need more tradesmen than ever before. Training is a win-win for both the company and the employee. We are forever thankful for our Spec Rents team. Their hard work, dedication, and loyalty help to increase the safety and productivity of our customers and we appreciate all they do. Happy Thanksgiving to you and your family. May your turkey be moist and your home and heart be full of love and thankfulness this holiday weekend. What’s big, orange, and partially round? If you guessed a pumpkin, you’re right. It is almost Halloween, of course! But the answer I was looking for was a Mud Hog, one of the many fabulous creations by EZG Manufacturing. Read below on how these bad boys can help you out. At a time when everyone is scrambling to meet the requirements of the recently updated OSHA silica regulations, many are still asking what is supposed to happen with the mixing stations. OSHA conveniently (or not-so-conveniently) left this out of Table 1. Because of this, there’s no guidance of what is to be done here. So, what’s a contractor to do? Pause for a minute before agreeing to use respirators (N95 most likely). There’s a chance the General Contractor will assume this is what should be done but this opens a whole can of worms (and medical exams, fit testing, and paperwork) that you probably don’t want to do unless absolutely necessary (note: that there are some activities within Table 1 that may require it). See our blog on Voluntary Use of Respirators for more information on this subject. Check with your supplier or masonry association to see if you’ve got any access to objective data to show you’re under the limit. If you’re buying pre-mixed mortar, you may be able to get testing that is similar to what you’re doing from your suppliers. This will likely need to be in the same general region as you are working or the mix design and conditions could be different, causing OSHA to not accept it as objective data. Check with your local or state association to see if there’s any objective testing available for either pre-mixed or batching. If you can’t get objective data that works for the way you’re mixing, you can perform testing of your own but be careful to follow all steps and requirements for testing, including posting results, allowing employee representatives, etc. If you’re over the PEL, you’ll need to determine what respirator your employees need to wear and follow the guidelines of the respiratory protection standards. Stay tuned in to MCAA and with your suppliers. Manufactures, like EZG, are actively working to develop solutions to help contractors keep working, despite these new and challenging requirements. If you have ideas on creating better ways to handle these issues, partner with your manufacturers or suppliers to develop these solutions, when possible. Regardless of whether you have the data to show you are under the PEL or not, if you’re making a big cloud of dust at your mixing station, you could still be a target of OSHA and/or the General Contractor’s safety person. Both groups can (and probably will) stop work until you can prove otherwise. If your mixing station shuts down, you’re not going to be laying units for much longer. It could take you a bit to find the necessary paperwork- so the easier access your crews have to all documentation, the better. How confident are you that your team is following everything in the regulation? Do you have paperwork for every other potential silica-producing activity? Is your respiratory protection plan up to date and does your crew know about it? Is your SDS/HAZCOM all up to date and does your crew know about it? Has your crew all been trained on silica and do you have proof? Does your crew know who your competent person? If there’s enough dust, OSHA may decide to do their own air monitoring and, even if you have objective data, you may be stuck with the test results that they do. See OSHA’s memo for the Flowcharts they use to determine whether air sampling is necessary or not. The big question is- how do I reduce the dust at the mixing station? Like any other dust control system- whether wet or vacuum- it is dependent upon the person operating it to be trained and use it correctly. Running the mixer a few rotations with water before they open the grate to check the mix is necessary to avoid dust. This may seem like common sense, but mud men are used to seeing their mix so there will be a learning curve. Spec Rents is a proud distributor of EZG Manufacturing products, including the above-mentioned mixers. Like other products we carry, we know that these products stand the test of time. Less downtime = more units in the wall. Whether it’s less breakdowns or fewer arguments with the General Contractor’s safety guy about a cloud of dust at the mixing station- the above EZG products will make you more productive. That’s something we all need. Check out our Silica Solutions product page for more info or contact us if we can help you in any way to navigate this regulation. Today marked the first day that OSHA is requiring employers to be in full compliance with the new Respirable Crystalline Silica in Construction Standard (29 CFR 1926.1153). Mason Contractors Association of America (MCAA) is working to track citations related to this rule. They ask for your help in tracking these so they can address them at a national level. If you get a citation, please contact the MCAA office at 800-536-2225 and ask to speak with Jeff Buczkiewicz . They will likely ask for a copy of the citation and move forward with any assistance we can provide. See full article from MCAA: Silica Rule Full Implementation Begins October 23. Last week, OSHA issued this memorandum to OSHA Regional Administrators to provide interim enforcement guidance for Compliance Safety and Health Officers (CSHOs) beginning today. This will expire when the standard's companion compliance directive becomes effective and available. Collect personal breathing zone samples when tasks listed in Table 1 are not being fully and properly implemented or if required by their flowcharts. See below Flowcharts A and B that will be used in OSHA's memo. Review the employer's written silica Exposure Control Plan and other relevant programs (e.g., respiratory protection program, hazard communication program, etc.) as part of the investigation.) Members of MCAA can create a plan/policy by clicking here. Interview affected employees, including the competent person, as part of the overall assessment of the employer's implementation of its Exposure Control Plan. The use of compressed air for cleaning is allowed where the compressed air is used in conjunction with a ventilation system that effectively captures the dust cloud created by the compressed air, or where no alternative method is feasible. The employer's exposure control plan must include the description of the housekeeping measures. Employees who will be required a respirator for 30 or more days a year applies per employer. Any partial day of respirator use (even if for only one hour or less) is considered one day of respirator use for the purposes of medical surveillance requirements. OSHA revoked their National Emphasis Program on Crystalline Silica which provided guidance to CSHOs for targeting inspections of jobsites with the potential to generate elevated exposures to crystalline silica. For more information on how you can comply with this new rule please visit our Silica Solutions page or contact us. We're happy to help you find the solutions you need to stay safe and productive by offering free consultations and a full line of dust collectors and wet saws. With the updated silica regulation in effect, there are still a lot of questions out there. I'm asked all the time, "If my guys are not required to wear a respirator, can they still wear a dust mask if they want to without having to do fit testing and medical testing?" Are employees wearing a dust mask or a respirator? Because there's a difference. A N95, usually referred to as a "two-strap dust mask" is actually a respirator. Usually dust masks have one strap. A dust mask is not NIOSH approved. What are the employees doing? Make sure that what they're doing really doesn't require them to wear one. If you're following Table 1 and it requires the employee to wear a dust mask, then you had better be requiring them to wear one. See below. If you're not following Table 1, do you have the data to show that they are under the PEL and don't need one? For example, if you're mixing mud, you might be able to get this from your suppliers (I know Amerimix and Spec Mix both have some objective data they can share with you). Or, if you've done your own testing that shows you're under the PEL for specific tasks, this should be sufficient. If it's a N95, it is a "disposable respirator" that should be disposed of after use or when it becomes damaged or soiled. If it's a N95, you can't clean or disinfect it. It will not interfere with employee's ability to work safely (this could mean that it interferes with another piece of PPE or limits their vision). See a letter of interpretation from OSHA about respiratory protection dated November 22, 2011 for more information about voluntary use of respirators. The employer must provide the information in Appendix D to each voluntary wearer. I recommend having employees acknowledge receipt of Appendix D.
The perfect place for this is in your new employee packet. For those already employed, a "tool box talk" could allow employees a time to complete and sign acknowledgement forms during silica training. Make sure that you have trained your employees the difference between when they are required and not required to wear a respirator. Make sure they know they are wearing them voluntarily if not required. OSHA will likely ask any employee wearing a respirator if they have been fit tested and gone through a medical examination, along with whether they know about your respiratory protection program. Using a handheld grinder for mortar removal (i.e. tuckpointing) with dust collection system. See Back to the Grind: Using Grinders according to Table 1 for more information about grinders. Thank you to Brandon Boyd, of Salus Consulting Services, who presented to the Associated Masonry Contractors of Houston last week about the new regulations. Brandon is a great resource should you need help adjusting to these requirements. His company focuses on helping companies achieve safe, quality production. You can contact Brandon at bboyd@salusconsultingservices.com or visit www.salusconsultingservices.com.